59.9%. Arsenal's odds of finishing Top Four are now just a hair below 60%. Of course, those odds are a little longer than Chelsea's (70.2%) or Tottenham's (61.8%). But, the odds are better than 50/50 with eight games to play. Four of those eight games are on the road, and of them, West Brom has the best home record, with 29 points (Newcastle has 25, Fulham has 24, QPR has 13). That means three points tomorrow would be a significant hurdle moving forward. Arsenal still needs help from the Chelsea and/or Spurs to drop points, so the Gunners can't take their foot off the gas pedal now. This Nacho doesn't even have knees! There appears to be not much difference in terms of who was available last week and who is available this week. There is "an outside" chance Theo Walcott and/or Jack Wilshere could return, but I would not expect it. Both returned to light training this week. Nacho Monreal left last week's game with a knee injury, but he has been declared fit for tomorrow. As a result, I see almost no reason to tinker with the starting XI, even if it does mean more of the "which Gervinho are we going to get?" game. Unless Monreal drops for Kieran Gibbs, which is equally plausible. Wow, this section looks empty when there aren't a ton of players hurt; I suppose that's a good thing. Predicted XI: Fabianski, Sagna, Mertesacker, Koscielny, Monreal, Arteta, Ramsey, Rosicky, Cazorla, Gervinho, Giroud. Team news is light for West Brom as well, which is making for very quick writing of this preview, I must say. The only doubt is Scottish midfielder James Morrison, who has not played since picking up a hamstring injury against Stoke just before the international break. The Baggies have two long-term injuries, as both George Thorne and Zoltan Gera are out for the season with ACL injuries. 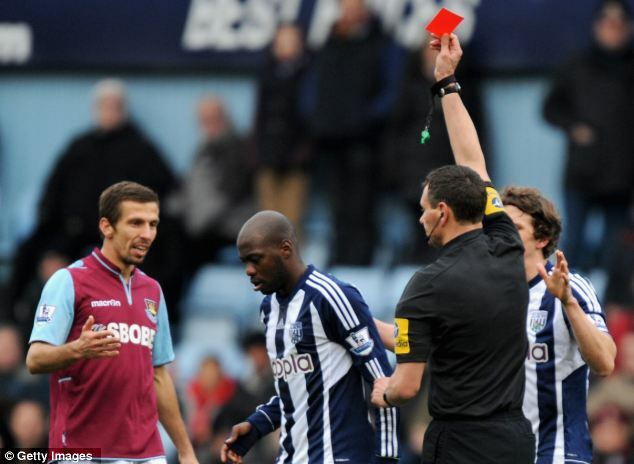 Youssouf Mulumbu starts serving a three match ban for the red card he picked up last week against West Ham. Since this section is so empty, the following is some things I learned about the city of West Bromwich: The Latin motto on the town coat of arms translates to "Work Conquers All," but we all know that all work and no play makes West Brom something something, the town was mentioned in the Domesday Book of 1086 as Bromwic, or "broom village", and it's the largest town in the U.K. without its own Royal Mail postcode. Since that week in February where Arsenal decided to crash out of two competitions by losing at home to Blackburn and Bayern, and aside from that couple of minutes in Tottenham in early March, things are clicking along pretty nicely for Arsenal. They have won six of their last eight in the league and remain in some measure of striking distance for the Top Four Trophy. But, you probably know that story already. As for West Brom, you may recall that they had a high flying start to the season (they were in third at one point in late November!) Since then, they have tumbled as far as ninth, after a stretch through the beginning of February that including one draw and no wins in six matches. They righted the ship a bit to win three of four after that, but since then have drawn Stoke and last week lost to West Ham 3-1 at Upton Park. The Baggies are now 8th in the table with 44 points. They look to be coasting to a comfortable mid-table finish. Saint Marton of Fulop eased Arsenal's passage to third place. After two Almunia-related debacles in 2010/11, Arsenal have won three straight against the Baggies. Last year, Arsenal won comfortably 3-0 at the Emirates and 3-2 at the Hawthorns, a bonkers final day of the season match in which, as you may recall, Marton Fulop was the hero for Arsenal. Also, that Kieran Gibbs slide tackle. Also, Santos scored. Arsenal won 2-0 in the reverse fixture at the Emirates in December, a match played after losing to Swansea but before losing to Bradford City. The Gunners scored both goals from the penalty spot on that day, with Arteta converting in the 26th and 64th minutes. There was quite a bit of controversy regarding whether Santi Cazorla dove to draw the first penalty, but you should also remember that Arsenal dominated the entirety of the match and West Brom never really threatened to score. Arsenal had won five straight against West Brom prior to 2010/11; they have now won eight of their last ten against the Baggies. West Brom's last win over Arsenal at the Hawthorns was in 2005. The referee is South Yorkshire-based Howard Webb. You might have heard of him. Arsenal have seen Webb three times this season, winning twice and drawing once. They won 2-0 at Liverpool with Webb in the middle in early September, beat Tottenham 5-2 in November, thanks to Emmanuel Adebayor's red card, and drew Swansea 2-2 in the FA Cup at the Liberty Stadium in January. Arsenal are unbeaten in their last four matches with Webb in the middle. 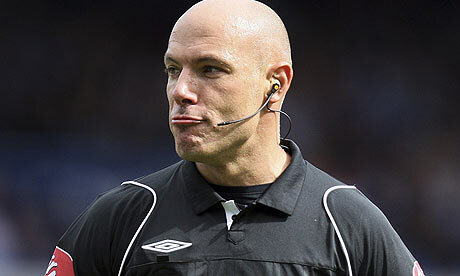 Oddly, this is the first time Howard Webb will work a West Brom match in over two years. I'm not really even sure how something like that happens. 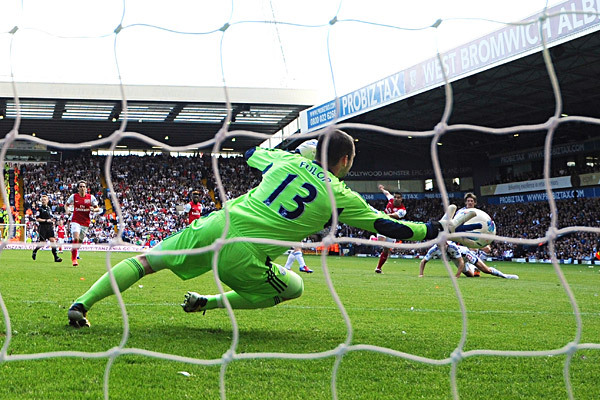 The last time Webb was in the middle for the Baggies, they lost 2-0 at Bolton on Boxing Day in 2010.